The world at large celebrated the 150th Anniversary of Richard Strauss; in Denmark they could have celebrated Louis Glass as well, but I doubt that he is held in such high esteem even in his native country. Carl Nielsen, who was born the year after Glass, is another matter and naturally he overshadowed the other composers of his generation – unjustly, said the much younger Rued Langgaard (b.1893), which led to him being boycotted by the musical establishment in Denmark for many years (review ~ review ~ review). To distinguish oneself in comparison with a master like Nielsen requires a strong personality and an innovative mind, and those are the qualities most obviously absent in his music, at least what little of his oeuvre I have heard – some piano pieces and a couple of chamber music works – before I got the present disc. His six symphonies are probably his most important works, and they have all been recorded before by Danacord. Listening through the symphony I can state that his craftsmanship is in no doubt. The structure is easy to follow and he develops the themes conscientiously. He also knits the movements together through recurring motifs. The latter is a device we know from César Franck’s sole symphony and it is well known that Glass was an admirer of Franck. His other great idol was Anton Bruckner and we can trace influences from him as well. A symphonist can have worse models, and I am not implying that this is a bad symphony, only that it is – a bit dull. The personality is missing. Still I can enjoy the noble and majestic melody of the opening of the first movement, played by the French horn and the open-air atmosphere; the pastoral idyll of the second movement with the perhaps predictable oboe solo. Then suddenly the idyll is broken by the fate motif heard also in the first movement and we are brought into a thunderstorm with rolling timpani. The storm soon fades away, though, and the idyll returns. The wild and aggressive third movement is supposed to depict the wood at night. It sounds decidedly more dangerous than the Danish woods look. The long final movement, light and idyllic, is the most Brucknerian. The orchestration is not very interesting. It is Bruckner with water. The symphony is however well worth a listen even though it isn’t an immortal masterpiece. We don’t go to gourmet restaurants every evening either but the local tavern serves solid well-cooked plain food that is eminently edible though the seasoning is scant. 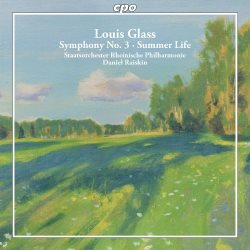 The other work on this disc, Summer Life, almost contemporaneous with the symphony, is actually tastier. There is more life and Danish joviality in this suite, which here gets its first recording. It is like five picture postcards and here the scoring is more varied and quite often is highly original. The first day of summer is jolly and optimistic, in the Forest Idyll we are sitting under an oak tree, insects are swarming, a bird sings in the tree top. On Field and Meadow takes place at harvest time, workers in the fields are busy – but we also hear the cows and sheep just standing there, watching … In the Evening Twilight stillness prevails, only the little bird is still singing … The Peasant Feast is certainly the most licentious movement. Robust, full of life and it gets wilder and wilder. The playing is excellent and the recording cannot be faulted. I wouldn’t rank this music very high on my list of Nordic symphonies. I think Gade (Chandos: Vo l. 1 ~ V ol. 2 ~ Vol. 4) in the generation before Glass – and also his teacher – and Børresen (review ~ r eview), roughly contemporaneous with Glass, are preferable. Even more so Ludolf Nielsen (review), but readers with an interest in Nordic music should be able to derive quite a lot of pleasure from this issue.